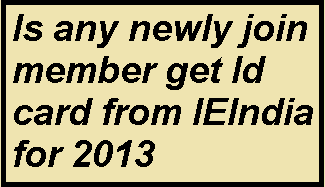 Hi all of you please shear this information on that question Is any newly join member get Id card from IEIndia for 2013 season . Because we get lots of query regarding that and unable to answer. It is obvious that all newly join member got study material and they fill up the examination form for seating winter 2013 but till today they not get their ID card. It is very frustrating because id card is mandatory in exam room . Generally IEIndia send those id card on mid of November but please shear the information if you receive id card for join in this season. It will give some what relaxation to all who are till now not receive id card and concentrate on study. Please share the date when you receive the id card. HAVE YOU HEARD LATEST NEWS ABOUT THE APPROVAL OF AMIE (I) ....THE M H R D IS WILLING TO WITHDRAW THEIR APPROVAL AND ASKED THE I E I TO TAKE APPROVAL FROM THE AICTE. Last edited by SUBRATA on Sun Nov 17, 2013 1:15 pm, edited 1 time in total. subham sir i got my id cardon 25 october 2013 at chattishgarh ambikapur which was dispached from kolkata on 25 september 2013.